Eating fruit is a delicious, nutritious way to stay hydrated. As many health experts note, most fruits are between 70-80% water, meaning that eating them facilitates the process of hydrating your cells. The added benefit of eating fruit is that doing so also provides your body with a wide range of vitamins, minerals, and nutrients that further optimize bodily processes such as metabolism function, digestion, and the regulation of your heart beat. Lemonade is a staple in many regions of the world, yet health officials oftentimes choose not to recommend it because of the artificial sweeteners that are added. Yet if you make your own fresh squeezed lemonade and use raw sugar as a sweetener, it becomes an incredibly healthy, delicious way to stay hydrated. As many wellness experts know, coconut water is a great beverage as a result of the fact that it is rich in potassium. Coconut water is also quite hydrating, making it a great option when you grow weary of the tasteless flavor that water can acquire after you’ve had several glasses. As of late, sports drinks have been discouraged as a result of their excess sugars. However, it’s important to note that there are many sports drinks that contain little artificial sweeteners, meaning they can still be a delicious choice when you’re looking for a hydrating alternative to water. Also keep in mind that sports drinks tend to contain electrolytes that help your body attain or maintain the delicate balance necessary for optimal functioning. Smoothies are a great way to keep your body hydrated, especially if they’re homemade with real fruit. Simply purchase your favorite fruits (peaches, apples, strawberries, etc.) and blend them up with a bit of ice and/or water. Tailor the amount of liquid you use based on the level of thickness you want. Also note that green smoothies are effective in keeping you hydrated, too. As many nutrition experts know, most lettuces are about 90%-96% water. This makes them an excellent option when you’re attempting to keep hydrated. There are numerous delicious salads that you can create with lettuce, but try to avoid using dried fruits as an ingredient because doing so contributes to the dehydration process. If you’re serious about optimizing your health and general well-being, it’s important to note that staying hydrated will play a primary role in helping you realize the goal. With that thought in mind, it’s also important to understand that you’ll likely get bored with drinking tons of water throughout the day in order to stay hydrated. 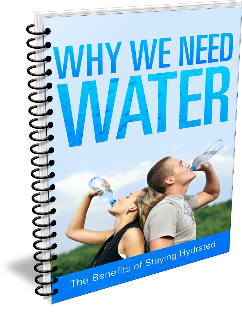 Luckily, you can use some or all of the tips and tricks outlined here to keep yourself hydrated. In so doing, you’ll likely become the healthy, happy person that you want to be.